Stringfellow Hawke is a freelance agent with the CIA. A highly skilled helicopter pilot who earned a considerable number of medals and commendations for his actions and bravery during the Vietnam War, Hawke was content to leave the excitement and the danger behind when the war ended, even though that also meant losing the ability to search for his older brother and best friend, Saint John Hawke, who was also a pilot in that conflict but was listed MIA. As the two-book series, or rather the television series from which the novelizations were drawn, commences, Hawke is nearing his mid 30's and is content to live in his rustic cabin high in the mountains of California though near enough literally as the eagle flies to Hollywood to be a pilot for his mentor and old friend, Dominic. This perpetually upbeat owner of Dominic Air, which ferries anyone needing a helicopter but specializing in television and movie work, helped raise the two Hawke brothers after their parents died in a boating accident. When he was in Vietnam, he and his brother were seconded to work with a division of the CIA called the F.I.R.M., headed by Michael Coldsmith-Briggs III, codename Archangel. After the war and before he went to work for Dominic, Hawke had been a test-pilot for the company working for the F.I.R.M. to create the revolutionary helicopter named Airwolf. 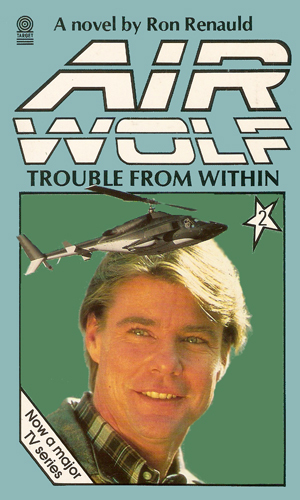 The premise behind the television series, and thus the books, is that the creator of Airwolf, Doctor Moffet, had stolen the only prototype and fled with it to Libya where he was using it to grow rich blowing up targets that the dictator, Qaddaffi, wanted gone. This included an American destroyer off the North African coast. To get it back Archangel goes to the best pilot he knows for the job, Hawke. For his part, Hawke has no interest in getting back into any fray but finally agrees if Archangel will help find his lost brother. After considerable trouble and the death of a fellow agent at the hands of Moffet, Hawke and Dominic manage to get their hands on Airwolf. When Archangel's promised information on Saint John proves less than informative, however, Stringfellow Hawke decides to keep the incredible aircraft. He hides it away in a desert mountain cave and brings it out only when a special mission interests him or he is further coerced by Anchangel or others. 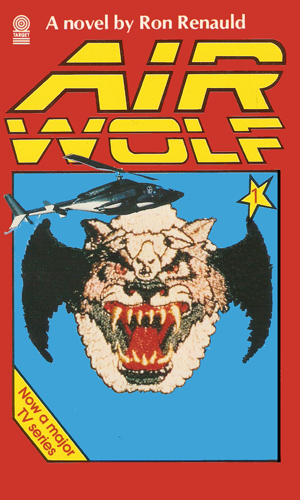 The novelization of the pilot and initial episodes, this book deals with the theft of Airwolf by its creator, Dr. Moffet. Stringfellow Hawke is coerced into heading to Libya to steal it back from Moffet and Libyan leader Qaddaffi. Novelizations of two episodes. The first, Daddy's Gone a Hunt'n by Burton Armus, has Hawke trying to keep an old friend from stealing new technology to get back a son he has never seen. The second, Bite of the Jackal by Nicholas Corea, deals with the need for Hawke to rescue Dominic and a young girl, stuck out in the desert. As he goes about this, though, he is pursued by a Firm agent out to capture Airwolf. Published & Printed by World International Publishing in the UK. A Collection of stories, most likely comic and text. In 1984, CBS began airing the first of three seasons of action-filled airborne excitement in the show Airwolf which starred the handsome and popular Jan-Michael Vincent, making him the highest paid actor on the small screen at the time. The role of Dominic was fantastically played by the terrific veteran actor Ernest Borgnine. Archangel was played by Alex Cord who, with a patch over his left eye and dressing in all white suits, could have been the subject of his own dashing spy series. The role of Airwolf was played by a Bell-222 helicopter, redressed to make it look even more ferocious. The crew of the initial Airwolf program wore a patch on their uniforms with the insignia of a wolf's head with bat wings. While ratings were good enough in the first year to get a second and still high enough to justify a third, CBS pulled the plug on the show at the end of the third season. the new USA television network, however, decided to bring the series back the following year (1987) but with a totally new cast. Dominic is killed in an explosion and Archangel is reassigned. Only Stringfellow Hawke is around and then only for the initial episode in which it is revealed that Saint John is still alive and working undercover for another agency. 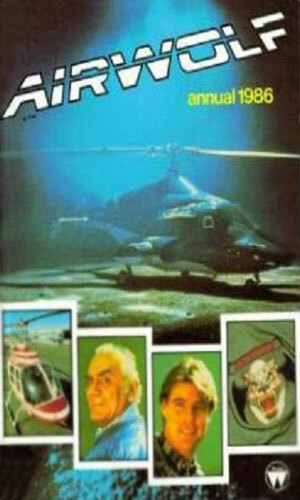 A reunion between the two brothers occurs and the passing of Airwolf is done as Stringfellow heads to places unknown. The revived and revised show lasted one season and starred Barry Van Dyke as St.John. 45 Where Have All the Children Gone? I was a big fan of the show during the first season, watching every episode with great enjoyment. Most of the second season also got viewed but with not so much enthusiasm. Jan-Michael Vincent's moody mopping got to me, as well as life pulling me in other directions. I saw very few of the third season which apparently was the case with most of the country. I saw none of the USA episodes but now after all these years, I think I will see if I can. This series belongs in this compendium because the jobs that Hawke gets called to do are mostly by the CIA, aka the F.I.R.M., and do fit in the normal ranges of assignments from blowing up something to rescuing someone. The hero just gets to use a really cool looking piece of equipment to do it in. There is, however, very little to hold your attention outside of this cool action. Hawke is a stilted and stiff as a board while, granted, being a hunky looking board doing so. I got tied of Hawke really early in my viewing. If it had not been for the Airwolf, Dominic, and super-cool head agent Archangel, I would have quit long before I did. Mr. Renauld did a very good job with the novelizations, giving more personality to the lead character than Vincent did the acting, outside the smoldering that he did so well.